When Daddy sent me his essay on eating eggs for this week's lunchtime series, I sent him back the question I've been wondering about for months --- how many eggs can we safely eat in a week? Like many other people, I had heard that eating too many eggs caused high cholesterol. Daddy --- and numerous websites like this one --- debunked that myth. Eating cholesterol doesn't raise your cholesterol. Government health agencies are now putting no limit on the number of eggs you should eat in a week. Good timing since those girls are laying up a storm! 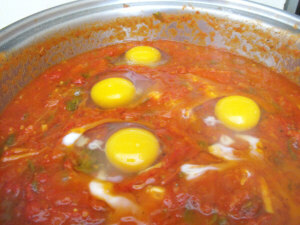 Guess we can poach some eggs in our tomato sauce for lunch today. But there are still some problems with eggs. Stay tuned this week for an analysis of the problems and solutions.